This is a clarification of some remarks I've made about Calvinism and Reformed theology. Some of those may prompt people to think that I'm an enemy of Calvinism. Not hardly! So, if you're an angry Arminian (read closely, I'm not talking about Armenians), don't be looking to recruit me in a crusade against Calvinism — I get good teachings from both camps. Remarks like those above can get me into trouble, what with people putting words in my mouth, reading too quickly, and the like. Fact is, there are Reformed doctrines that I fully agree with. One is perseverance of the saints (or the somewhat derogatory "once saved, always saved"). That doctrine is misunderstood by its detractors, but I can make a reasonable case for it. This belief is contrary to traditional Arminianism, but briefly, if you cannot obtain salvation by your own efforts, you cannot keep it that way, either. Or was the sacrifice of Jesus on the cross insufficient after all (Heb. 10:10-14, 2 Cor. 5:21, Rom. 4:1-8)? A doctrine saying that you can commit a sin just before you die and end up in Hell is unscriptural, and disgusts me. God did not give us a spirit of fear, but security and peace. Another doctrine that Calvinists and Arminians agree on, and I join in, is often called total depravity. No, it doesn't mean that nobody can do good things (Matt. 7:9-10). Rather, it says that sin taints every part of us, including our thinking. People can have a measure of "goodness", but do not meets God's standard. Anti-theists and anti-creationists believe they are doing "good" by persecuting Christians and creationists, but their thinking is corrupted, and they are actually doing evil. We have all sinned (Rom. 3:23, 6:23) and need God's mercy (Eph 2:8-9). When I study on it a spell, it seems that the foundation of Calvinism is the doctrine of election. Now, I cannot debate the subject effectively, and freely admit that there are some support verses that I can't fully deal with. However, there are verses that also seem to indicate that Christ died for all, not just the ones he chose ahead of time that would be saved. 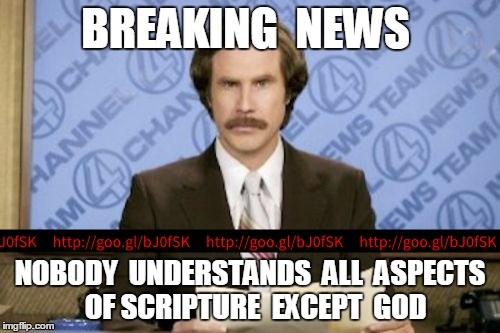 When those are pointed out to Calvinists, they give a kind of answer that indicates that the plain reading of the inerrant Word is unclear, and they have the right understanding, so they have to explain it to you. The first two doctrines that I discussed above can be defended without the doctrine of election, but it seems to me that if Calvinism loses that doctrine, the others collapse. Calvinists seem to have a high regard for Scripture) which surprises me when people like Dr. R.C. Sproul vacillate on Genesis). I've encountered Arminians who not only have a low view of Scripture, but are willing to introduce heresies (theistic evolutionists use a form of the Pelagian heresy). So, I am convinced that neither camp is completely right, but both have truth in some of their views. Also, there are people that I believe will accept doctrines or beliefs because someone they admire accepts them (a kind of genetic fallacy). Whatever teaching or doctrine is presented, compare it with Scripture, keep it in context, and don't reject a fellow Christian who does not happen to hold to your favorite views on these matters.